So you all know I dabble in game design at an almost constant background level. I do it most often when I’m overwhelmed by anxiety or can’t sleep in the middle of the night. It’s like meditating on an orderly world, and it somehow uses fewer processing cycles at its most intricate than creative writing or almost anything else does. So I started a game design experiment the night before flying out to WorldCon, a bit over a month ago. And then I ignored it, only to pick it back up and poke at it during the last few of the long nights we were visiting the hospital. And then during the week after that or so that I was bombed out of my mind on cough syrup and allergy meds, I really threw myself into it. And so now I have created RealmLike, a retro-dungeon crawler and minimally multiplayer online RPG. The name “RealmLike” derives from RLML, for “Rogue-Like/MUD-Like”, naming its two most immediate influences. 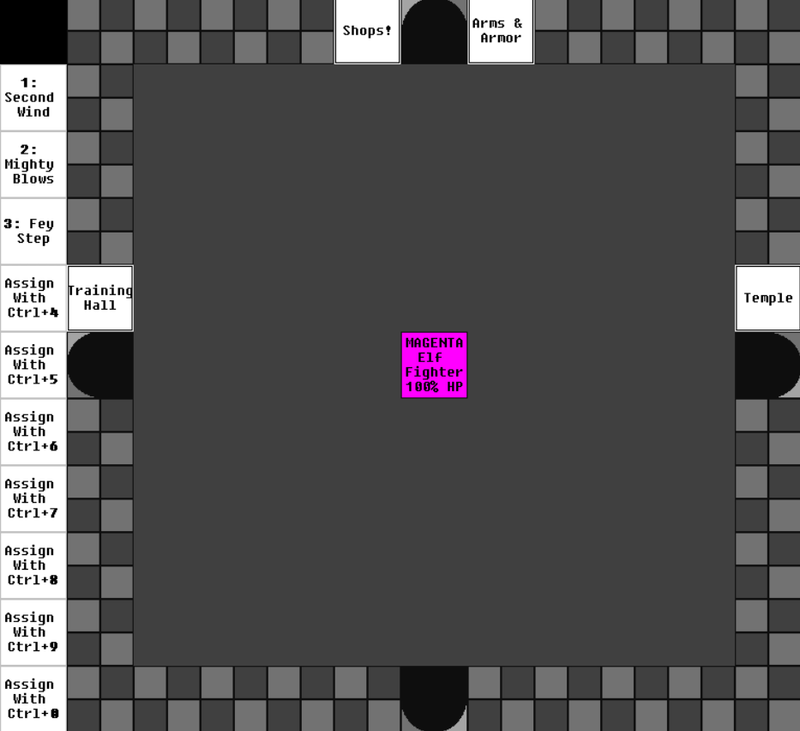 It’s a functional game engine that is capable of generating a dungeon 250-some tiles across and 255 levels deep in a matter of seconds (though it’s currently set to a slightly more reasonable size, five levels deep), which can then be explored in classic dungeon-crawl style with some modern sensibilities (like skill trees, multiclass, and hotkeys for spells and abilities). 21st century text-based graphics don’t have to stick with “d” for “dog” and “g” for goblin. We have enough space to spell things out. Game has been coming along well, I’d like to bring it along further, but it could really use more hands and eyeballs on it to make sure everything in it works as well as I think it does. If you’re interested in checking it out, I am going to be leaving a server running. This game is made with the BYOND programming suite and currently requires BYOND’s client program to connect to it and play. You can download and install the suite here (it’s free! ), after which you will be able to join the game from its hub page. Controls are entirely keyboard based: arrow keys to move, keyboard keys are single-letter commands such as U for Use or G for Get. There’s a help page that is displayed when you first login (F1 can bring it up again) that lists all of them. Character options are a bit limited right now; four character class and four fantasy races (if you automatically and immediately know what those four are, you are probably right in the target audience) and they are capped at level 5 for the non-spellcasters and 3 for the spellcasters. But there’s some variety within them, with a minimum of two skill sets/sub-classes for each and some additional customization options for Clerics. The game is online, so if you join the server, you may theoretically be playing with other people. You can even form a party with ‘P’ and share experience (automatically) and other resources (voluntarily). Feel free to drag your friends along. There is no PvP right now, and while permadeath is an option, it’s currently turned off. I plan on including a full level progression, more character classes, more environments (and more details for the existing one), magic items, crafting, all the wells and bhistles, save for graphics more sophisticated than stick-on labels. But one woman can’t playtest a game herself, particularly a multiplayer one. Think of this as open alpha testing, like a Steam early access game. You can leave feedback on the game’s hub forum, or by using the GM Chat (hit F10). I’ll be “AFK” from the game most of the day but messages sent there are logged.